Gallery of Book Love — Charles Conyers, Jr. This is officially the FIRST photo of “World|Time” in the wild! I LOVE getting these pictures! Every book in the “World|Time Diaspora” series has a tag line. This one is for the second novel in the series, “World|Time”. 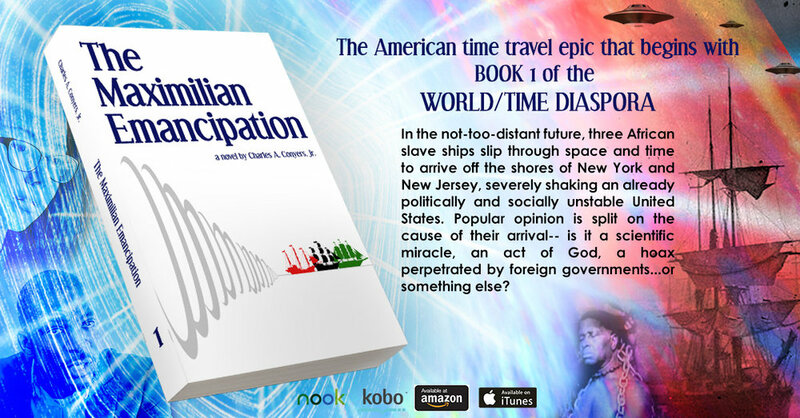 This is a screen shot that I shared of the latest and greatest— the sequel to “The Maximilian Emancipation” called “World|Time”! I am not a very good selfie-taker. This was an earnest, and slightly embarrassing, attempt to take a picture of myself holding up my first novel for the first time. I’m trying to get better at this stuff— I promise! Jack bought his copy of Oscar to usher the little one in his life into dreamland. I love this picture! Founder and owner of Bongo’s Fries gets his copy of “Oscar’s Dream World!” to read to his little girl Abby. Yay books! Oscar's Dream World gets a buyer! Zak was kind enough to use his hard-earned money to purchase a copy of my book! Oscar's out in the world! 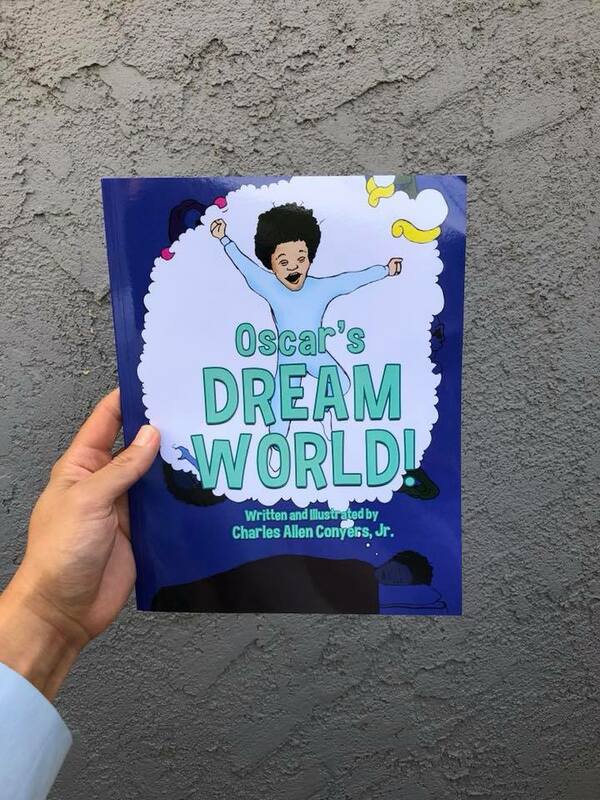 All the way in sunny California, fitness celebrity Charles Chen makes my day by purchasing a copy of Oscar’s Dream World! to share with his cousin. The Maximilian Emancipation gets another buyer! Alicia was excited to get her copy of “The Maximilian Emancipation”! Oscar makes it all the way to Amsterdam! He’s too young for the coffee shops (haha), but Oscar joins Sam and her kids overseas! The Maximilian Emancipation goes to the UK! I love getting pictures of readers with the books. This is a great one with a dog (I don’t know his name!) belonging to Cris and Keith. Fiorella was kind enough to send a shot of the book. Each one of the books in the “World|Time Diaspora” has a tag line. This is the one that goes with “The Maximilian Emancipation”. Having a graphic design background sure comes in handy as a independent author. This is one of the first designs that I developed to advertise “The Maximilian Emancipation”. This was created for Twitter. Michelle really enjoys the book! 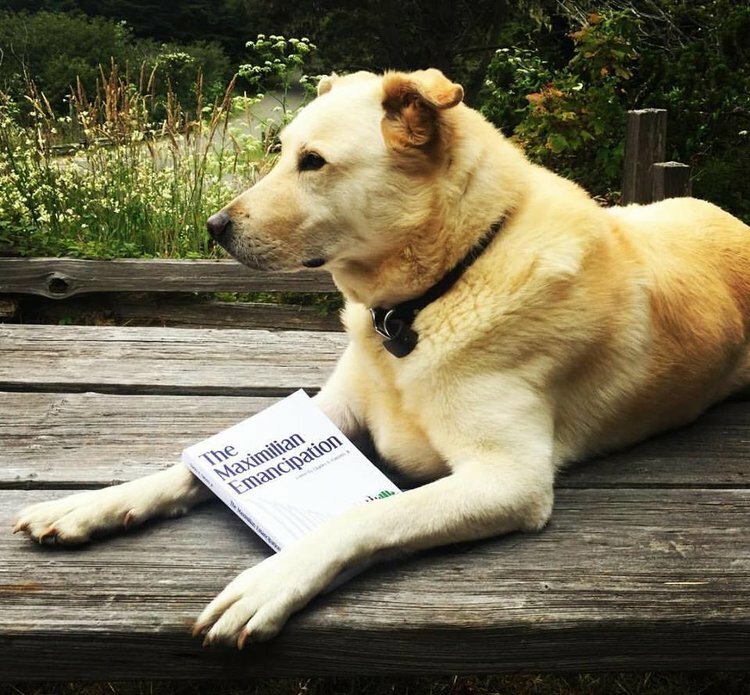 On Facebook, a reader named Michelle sent me an image of the book while she was reading it. I will never get tired of people sending me stuff like this! And I LOVE the Watchmen bookmark— how cool is that! For many, this was the first indication that I was even writing a book! This was a shot that you can find on my Instagram page. This was EARLY in the process of writing “The Maximilian Emancipation”. Being a screenwriter, I was still hooked on typing out everything in the Courier font. I have since moved on from that— it’s Times New Roman for me! Ewen shows off his new book! Ewen is another awesome reader sharing his experience with the book. Here he is on the subway in Manhattan, on his way to a U2 concert. I encourage everyone to share their book photos with me— very few things make me as happy as this! 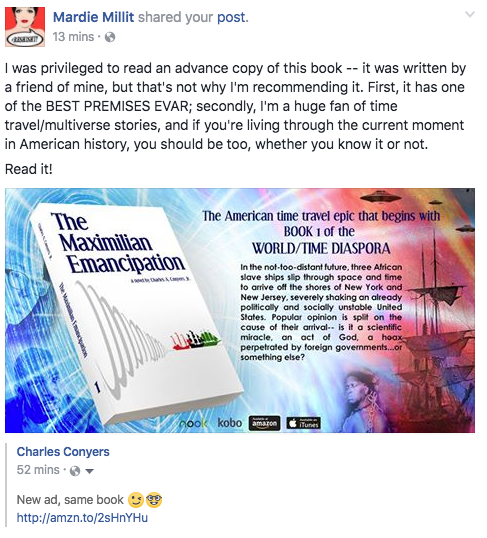 Erik is from California, and he let me know via Facebook that he received his copy of “The Maximilian Emancipation.” He rules! I feel bad about the headache, though…I hope the book didn’t make it worse! Getting these images ALWAYS makes my day! Amazon reviews! I LOVE Amazon reviews! Especially when they’re good— haha! Thom hit a part in the book that made him laugh, so he took a screen cap to show me that he approved. To be honest, I kinda ripped off that joke from a standup comic. I honestly don’t remember which one— either Patton Oswald or Jay Mohr. When another artist shows appreciation for your art, ya gotta love it! Mardie is a singer/songwriter who performs with a group called The Habib Kings. She was one of the first readers of the book, and her review gave me the will to write MORE! Dubi is a ready from New York City, and she sent me a picture when she got her copy of the book. This makes me so happy! 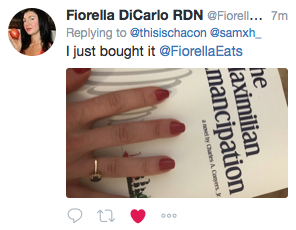 I love Fiorella— she’s awesome! Raquel read The Maximilian Emancipation in 2 days! Raquel is the owner and founder of Thavin & Marcob. She had a day off and devoted the time to read the book. She loved it so much that she gave it to her son to read! Raquel was kind enough to let me know when she finished the book. Thankfully, she loved it! Who wouldn’t love reviews like this!!!!! !